David was born in Wigan in 1970. He is an award-winning journalist and has worked in newspapers in the North of England since 1989 as a reporter, a specialist correspondent, a newseditor, a columnist and a features editor. He has reported from Bosnia and Kosovo; once made a pilgrimage to Jack Kerouac’s grave in Massachusetts; counts taking part in the “running of the bulls” at Pamplona’s St Fermin fiesta as his most frightening experience ever; and spent most of the Nineties lying in a field at the Glastonbury Festival wondering if it was time to go home yet. He is the lead singer with charismatic pop combo Chopper squad, who remain available for all festivals and functions. 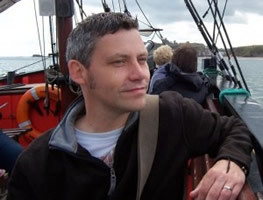 David lives in West Yorkshire with his wife Claire, their young Charlie and Alice, and two cats, Kali and Shiva. CLICK HERE FOR MORE BOOKS BY DAVID BARNETT. 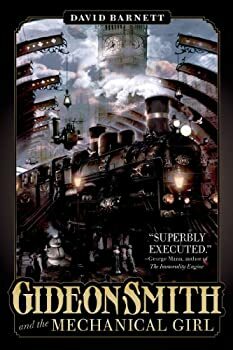 As one might perhaps be able to tell from the title, Gideon Smith and the Mechanical Girl (2013), by David Barnett, is a paean to the pulp adventure novels of yore a la Frank Reade and His New Steam Man. This sort of thing can be a bit tricky to pull off, as it is a fine line between keeping the spirit of the source material in terms of characters, dialogue, and plotting and crossing over that line into the trite and silly. For the most part, Barnett pulls it off. Enough so that I’d be interested in picking up the clearly planned sequel. 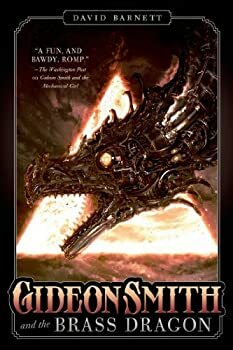 Gideon Smith and the Brass Dragon (2014) is David Barnett’s steampunk follow-up to Gideon Smith and the Mechanical Girl, and continues that first book’s solidly entertaining plot, even as it shares a few of the same missteps. As this is a direct sequel, there will be spoilers for the first book, so readers beware.